Pastels are timeless for spring, and independently of the color trends you’ll see them every spring. Wanna rock some too? 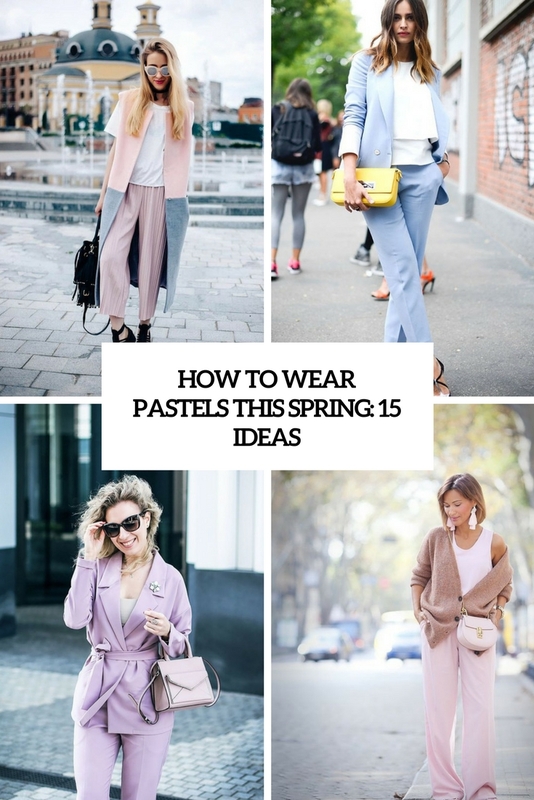 Let’s have a look at trendy ways to wear pastels to look fresh and spring-like. If you have to go the office, style pastels for work looks this spring! You can wear chic pants or culottes in pastel shades, add a neutral top and proper heels or flats. Or try a pastel pencil skirt with a white shirt – very refreshing! Pantsuits are one of the trendiest things now, and you can rock one in a pastel shade adding a neutral top and some eye-catchy heels – a bold professional look will excite everyone! Color block pastels – this is a very eye-catchy idea, which is though suitable for the office, too, if it’s allowed to wear many colors. Powder blue+blush, lavender+blue and so on – the combos are up to you! wear a floral midi or maxi dress with a pastel cardigan and boots, try pastel culottes and an off the shoulder or one shoulder top. Get inspired and rock pastels this spring!